The staff of the Historic Resources Management Branch wishing you a happy holiday! The staff of the Historic Resources Management Branch wishes each and every one of you a safe and joyous holiday season. We’ve worked hard to identify, protect and conserve Alberta’s historic resources this past year. Thank you all for taking a few moments each week to read about our work. RETROactive will be taking a break over the holidays; we will resume publishing new articles on January 8, 2014. We look forward to seeing you all in the new year! The Municipal Heritage Partnership Program and the Alberta Main Street Program do not have formal deadlines for grant applications. To maximize flexibility for communities, program staff receive applications from interested municipalities on a ongoing basis throughout the year. 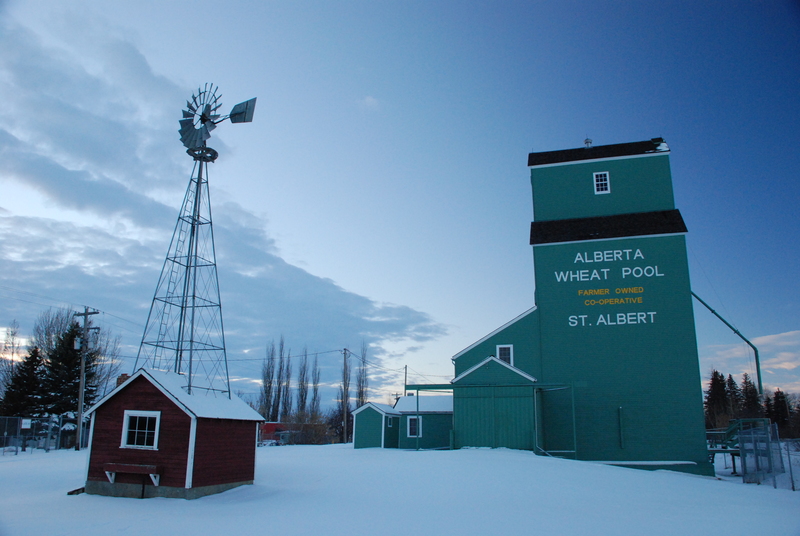 That said, since MHPP projects are funded by the Alberta Historical Resources Foundation, it is convenient for stakeholders to coordinate their applications with meetings of the Foundation’s Board, which generally take place on a quarterly basis. This allows time for staff to review applications and prepare recommendations for the Board, and for the board members to review materials in advance. Please note that the Heritage Preservation Partnership Program does maintain formal deadlines, of February 1st and September 1st of each calendar year. At the Nov. 29-30th meeting of the Foundation, the Board established its meeting schedule for 2014, which in turn gives us the requested dates for submission of MHPP and AMSP grant applications. For the February 21-22 meeting in Olds, submit by January 27th. For the May 9-10 meeting in Fort McMurray, submit by April 14th. For the September meeting 12-13 in Pincher Creek, submit by August 18th. For the November 28-29 in Edmonton, submit by November 3rd. If you have any questions about MHPP or AMSP applications, please feel free to contact us. Heritage Canada The National Trust’s annual conference will be in Calgary in 2015, at the Fairmont Palliser Hotel from October 22-24. Our annual Municipal Heritage Forum takes place in the fall as well. This convergence offers a unique opportunity: we are exploring the possibility of offering the Municipal Forum in conjunction with the Heritage Canada Conference that year. 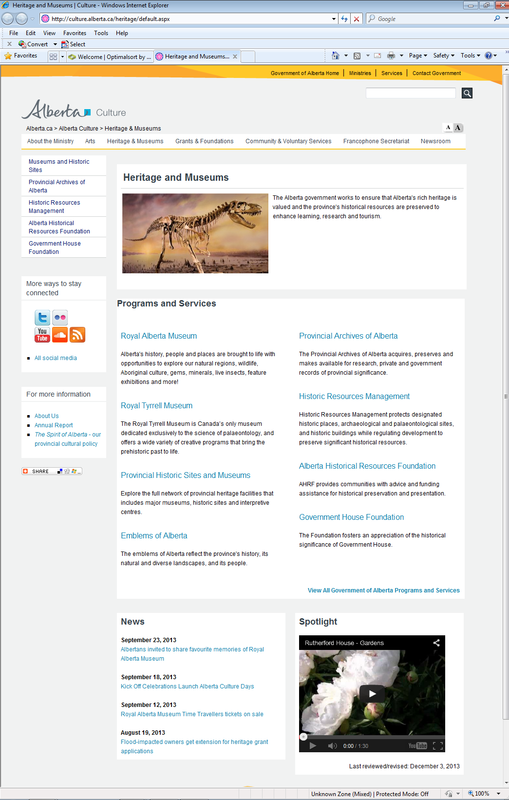 For those of you who don’t know what Heritage Canada is and what they do, I’ll provide a little background. Heritage Canada The National Trust (formerly known as the Heritage Canada Foundation) is “a national charity that inspires and leads action to save historic places, and promotes the care and wise use of our historic environment.” For the past 40 years, Heritage Canada has organised the only major annual conference for Canada’s heritage conservationists. Heritage Canada’s annual conference provides an opportunity to network with others working to conserve historic places, and to learn what innovative things are happening in other provinces and territories. In the 1980s and early 1990s, the Government of Alberta partnered with Heritage Canada to help develop the Main Street model for revitalizing historic commercial districts in Canada. Our Alberta Main Street Program was created as part of this partnership. I had the pleasure of attending this year’s conference in Ottawa. It was titled Regeneration: Heritage Leads the Way. Khalil Shariff delivered the opening keynote and his talk set the tone of the conference. Mr. Shariff is the C.E.O. of the Aga Khan Foundation Canada. He spoke of how historic places were an important part of the foundation’s strategy to improve economic prospects and social cohesion in cities in Asia and Africa. The individual sessions explored ideas of how heritage conservation builds community and fosters economic growth. There were sessions on how heritage enabled community development, and that provided examples of how to finance and organise conservation projects. You can see a complete list of the conference presenters (with links to their presentations) on the Heritage Canada conferences page. Before making firm plans for our 2015 forum, we would like to know what you think. Please take a look at the programs from Heritage Canada’s 2012 and 2013 conferences to get a sense of the presentations, and then take our survey. 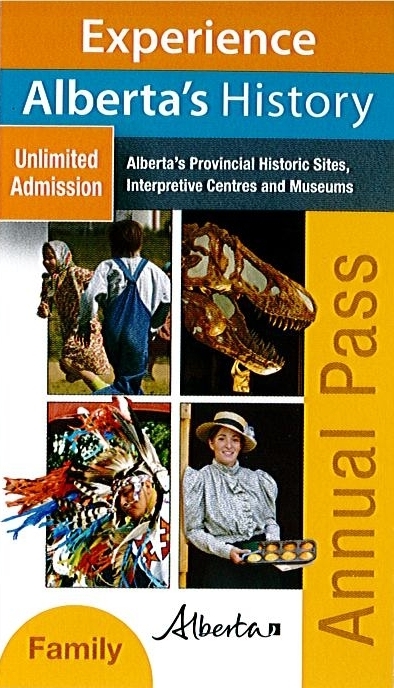 If you complete our survey before January 15, 2014 your name will be entered in a draw to win a 2014 Family Annual Pass to visit Alberta’s Provincial Historic Sites, interpretive centres and museums. * By “Win a Prize”, we mean that your name will be entered into a draw for the prize if you complete the survey. In addition, the Foundation also considered grant applications from the Municipal Heritage Partnership Program, and the Alberta Main Street Program. 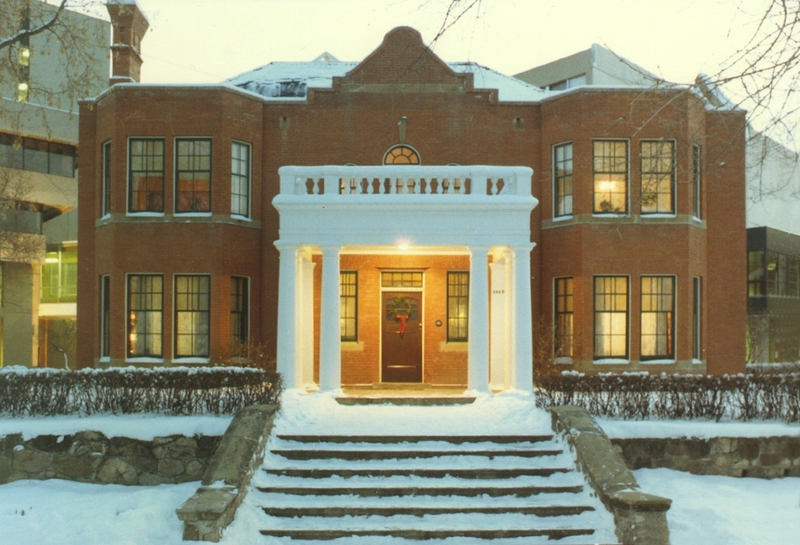 Starting on Friday afternoon at St. Albert Place, the major civic centre for the City of St. Albert, and a Douglas Cardinal-designed Municipal Historic Resource, the Board was greeted by Mayor Nolan Crouse. The mayor, a committed supporter of heritage, spoke eloquently about the City’s storied past since its founding as a Catholic mission over 150 years ago. He also brought the AHRF Board members up to date about recent heritage happenings in St. Albert. 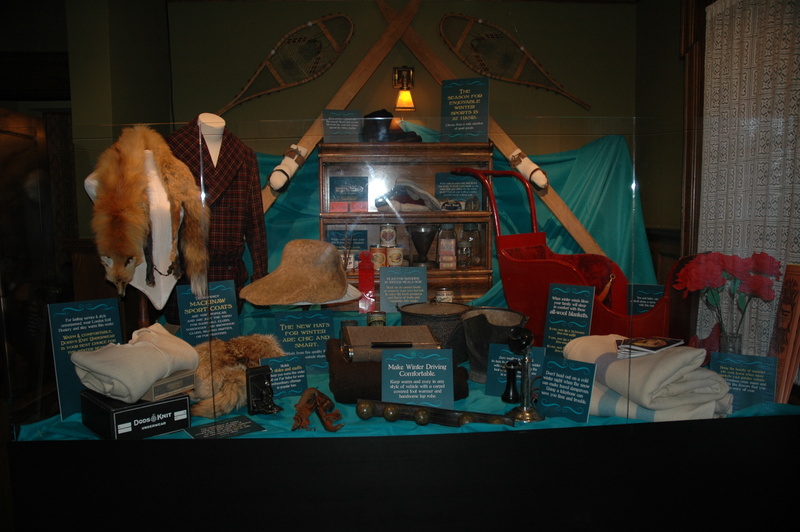 Departing from Council Chambers, Board members embarked upon a tour of the Musee Heritage Museum. 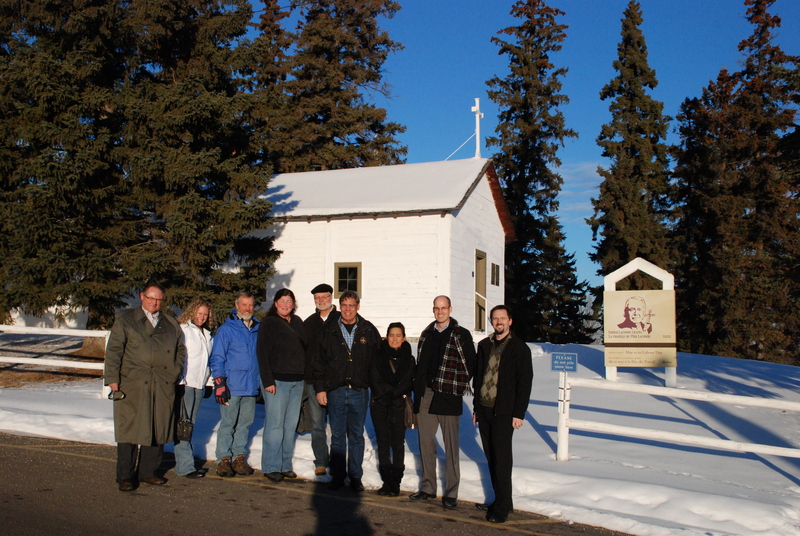 They then headed out into the snow under a bright Alberta blue sky to visit the Little White School and the City’s Mission Hill area, home to multiple Provincial Historic Resources, including the Bishop’s Palace and the Father Lacombe Chapel. The afternoon was capped off with an informative tour of St. Albert’s designated Alberta Grain Company Grain Elevator complex. The Board got down to business with Saturday’s meeting, where numerous grant applications were reviewed and key funding decisions made. Board Chair Fred Bradley was very pleased to welcome the Honourable Heather Klimchuk, Minister of Culture, who joined the meeting for a lunchtime discussion of key issues. Minister Klimchuk offered thanks to the Alberta Historical Resources Foundation for their dedicated work, and recognized several members who are completing their terms of service. Stay tuned to RETROactive for further updates on funding decisions made by the Board at their November meeting! We are working to make our Alberta Culture website even better, and RETROactive readers are invited to participate! You have opportunity to leave your name to be entered to win a $100 gift card. Help us make culture.alberta.ca easier to use by completing this short online survey. This post continues our look at the work of Alberta’s Archaeological Survey. Previously, we explored “10, 000 years of hunting in Alberta“, as shown in the archaeological record. While RETROactive will continue to be your source for news and information about Alberta’s historic places, we are branching out to provide insights into other aspects of our work to understand, protect and conserve historic resources. 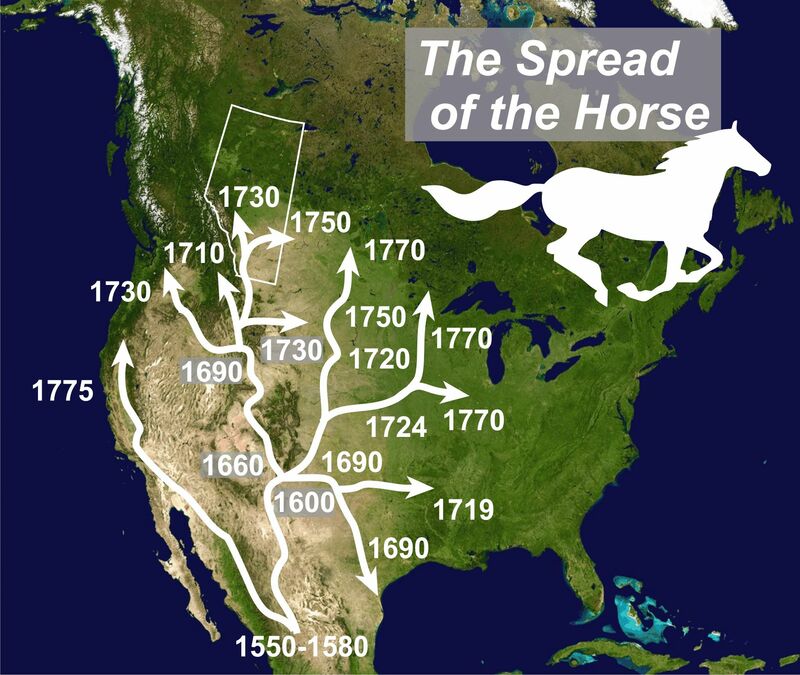 The chronological spread of the domestic horse into Alberta over the last 500 years. When horses galloped across what would become the US border onto Alberta’s rolling prairies in the 1720s, it was a bit of an overdue homecoming. It had been roughly 10,000 years since the province’s expansive grasslands shuddered under hard equestrian hooves. Fossils indicate that North America is the original home of the horse where it first appeared millions of years ago. Ancient spear from Alberta that was coated in blood of the now-extinct Mexican horse. 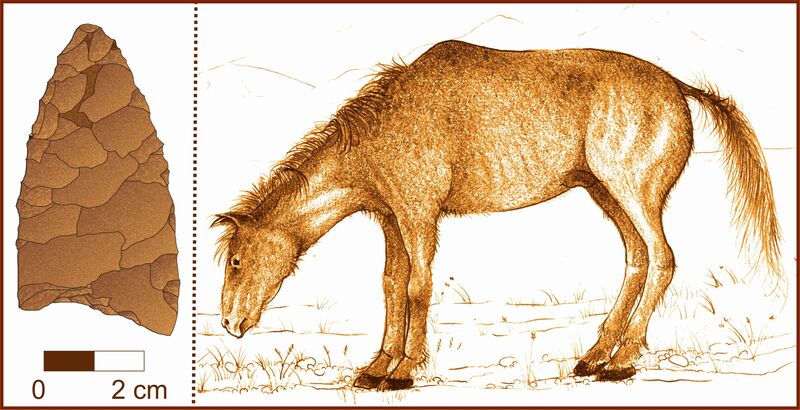 The now-extinct Mexican horse (Equus conversidens) ventured well north into Alberta’s tundra meadows and onto the menu of Alberta’s first humans. Ancient residues of horse blood were found on stone spear tips used over 10,000 years ago in southern Alberta. Fossil horse bones have also been found near Grande Prairie, Taber, Cochrane, and in the Edmonton area. Around 10 millennia ago, the horse mysteriously disappeared. When the horse returned with the Spanish 500 years ago it assumed a central role among Indigenous and European cultures in the West. The story of the horse in Alberta is a fascinating ride through the province’s heritage. Once groups like the Blackfoot and Assiniboine mastered horseback riding, the horse occupied just about every dimension of life on the Plains. The new hooved pets created new hunting strategies, they changed the way people moved across the prairies, and they altered the dynamics of Plains warfare but reconstructing when and how the domestic horse spread into Alberta has been tricky. Historic records offer only a handful of references to horse adoption by Indigenous people but a unique piece of heritage offers fleeting and beautiful glimpses of how the horse changed the West. 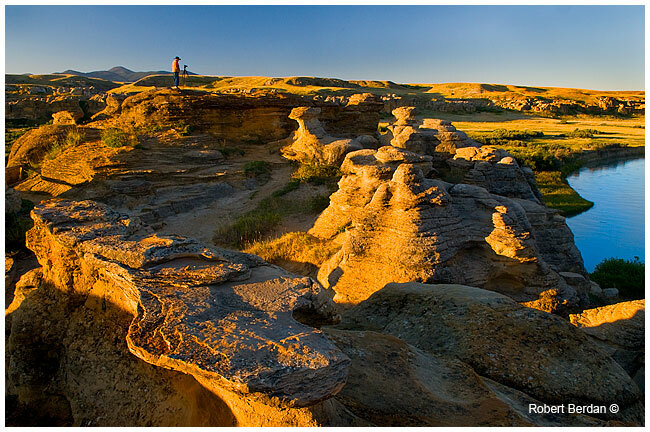 Writing-on-Stone Provincial Park in southern Alberta houses one of the largest collections of rock art in North America. For over a thousand years Indigenous people carved and painted their stories on the sandstone hoodoos and canyon walls and the horse looms large in those depictions. 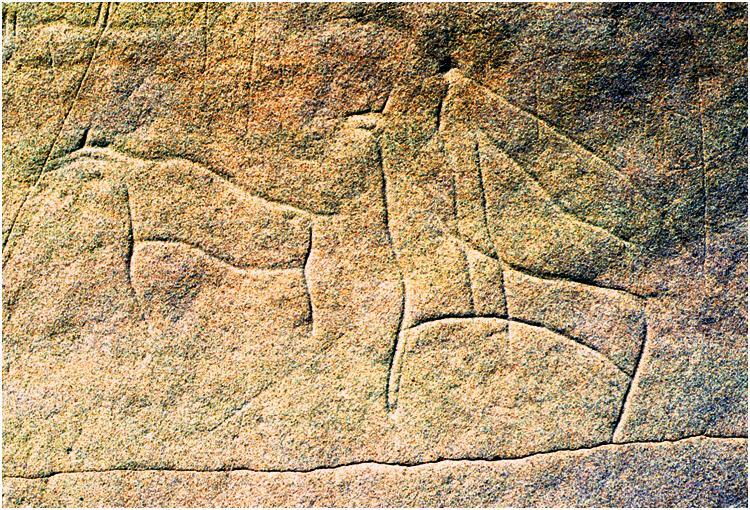 This carving (‘petroglyph’) from Writing-on-Stone depicts a domestic horse in a buffalo hunt. Horse carvings depict a wide variety of events and beliefs including battle scenes, hunting expeditions, and tallies of horses acquired through trading or raiding. In everyday life, some horses replaced the dog as beasts of burden while other horses were highly revered as ‘buffalo runners’, prized for being long-winded and intelligent while overcoming an 800 pound buffalo. For buffalo hunters who needed both hands free for their weapons, a well trained horse was a matter of survival. 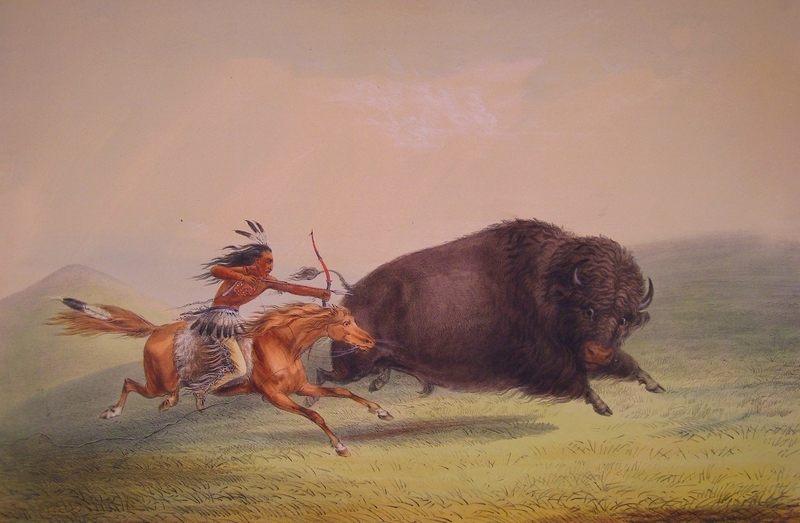 A painting by George Catlin from the 1800s of life on the Canadian Plains (reproduced with permission from the Bruce Peel Special Collections Library, University of Alberta). The horse also quickly galloped into peoples’ social lives. Families that acquired many horses gained prestige and respect. Horse raiding became a mark of courage for many groups and horses were traded for a multitude of things including European goods, food, membership into societies, and spiritual power. During the fur trade while slick beaver furs were motivating European economic interests in northern Alberta, horses, guns, and buffalo meat were becoming entwined in complex trade networks that would shape the history of the prairies. When the buffalo eventually vanished, the hooves of the horse pounded on. 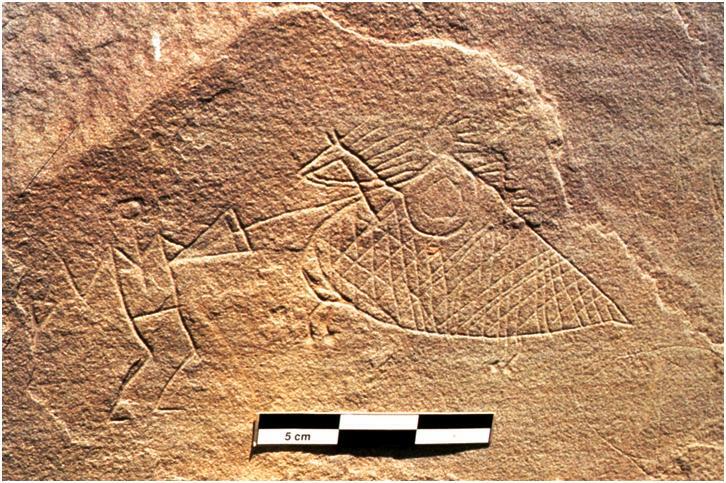 This combat scene from Writing-on-Stone shows an early horse draped with body armour (photograph reproduced with permission from Michal Klassen). The unique collection of rock art at Writing-on-Stone is a provincial treasure that captures pivotal centuries of modern Plains cultures. 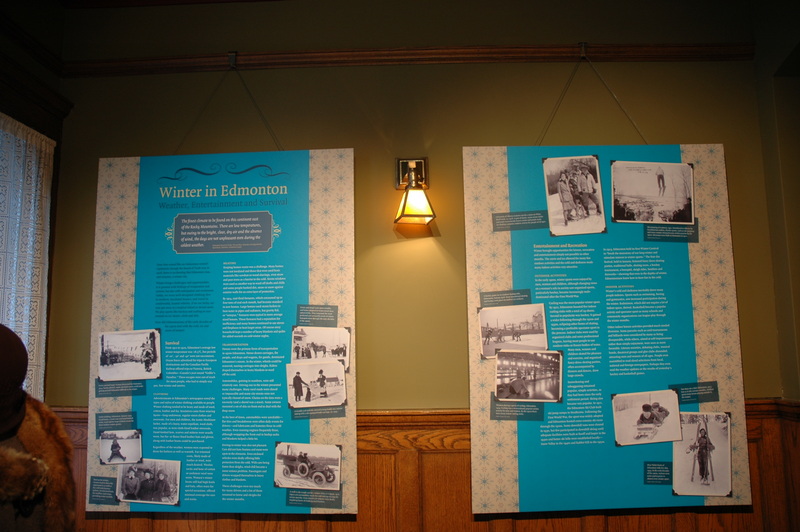 For this reason, the area is both a Provincial Historic Resource and a National Historic Site. Writing-on-Stone is still a sacred place to the Blackfoot people; a place where spirits dwell among the sculpted bedrock. Visitors are encouraged to learn the story of this powerful place. One of the many benefits of the stony archive of art on the Milk River is that it can be enjoyed and appreciated under blue skies. Morning light on the beautiful hoodoos at Writing-on-Stone (photograph reproduced with permission from Robert Berdan). What better way to learn how the horse changed the west than from reading the walls of Writing-on-Stone while cool breezes blow in hints of sage and a red-tailed hawk reads over your shoulder? Site protection combined with a healthy respect for Blackfoot traditions and the archaeological record will ensure that the history of the old West will endure and the story of the horse will ride on. Written by: Todd Kristensen, Northern Archaeologist & Jack Brink, Curator of Archaeology, Royal Alberta Museum.